Sea of red, white, and blue; photo by Pieter TER KUILE on Flickr (noncommercial use permitted with attribution / share alike). 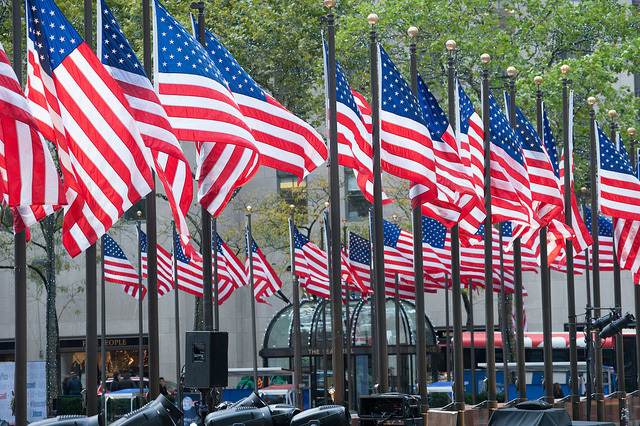 Although the colors did not have a specified meaning at the time the American flag was adopted, they were defined for the Great Seal of the United States in 1782: Red is a symbol of valor and bravery, white symbolizes purity and innocence, and blue signifies vigilance, perseverance, and justice. 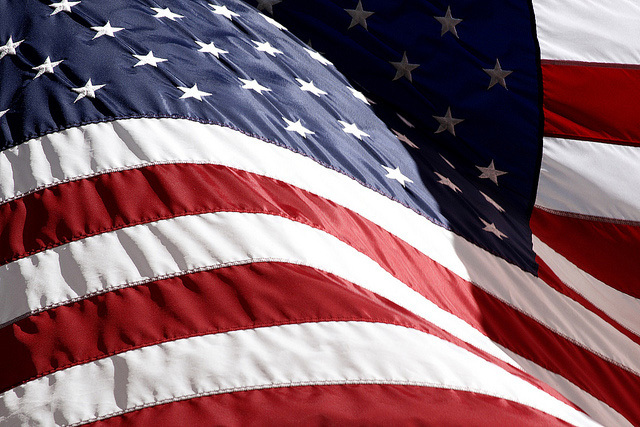 "The colours of the pales are those used in the flag of the United States of America; White signifies purity and innocence, Red, hardiness & valour, and Blue, the colour of the Chief signifies vigilance, perseverance & justice. The Olive branch and arrows denote the power of peace & war which is exclusively vested in Congress. The Constellation denotes a new State taking its place and rank among other sovereign powers. The Escutcheon is born on the breast of an American Eagle without any other supporters [figures represented as holding up the shield] to denote that the United States of America ought to rely on their own Virtue." Flag of the United States of America (also called "Old Glory" or "The Star Spangled Banner"); photo by Raul Luna on Flickr (noncommercial use permitted with attribution). All 50 state flags. 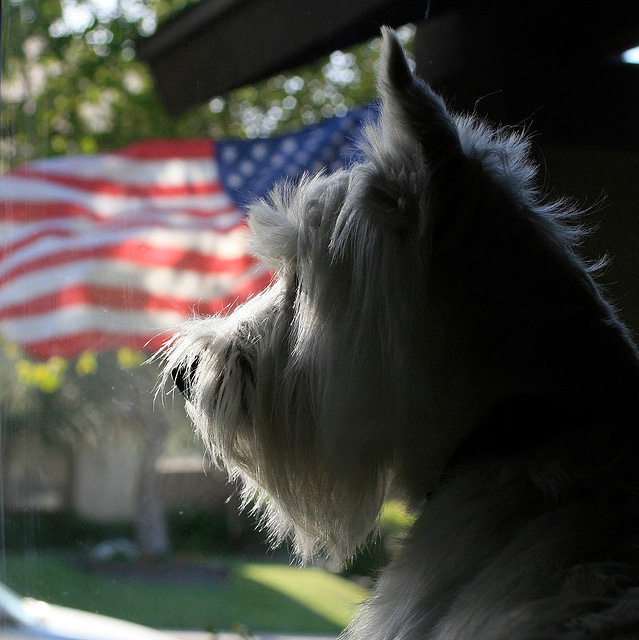 American flag and patriotic pooch; photo by Randy Robertson on Flickr (use permitted with attribution). 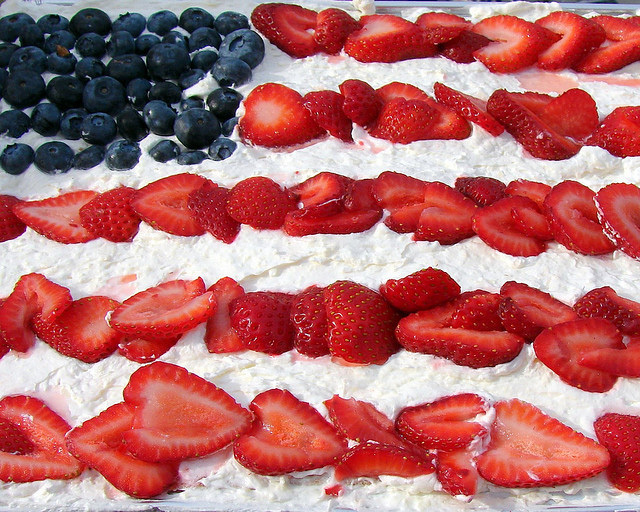 Patriotic red, white, and blueberry; photo by Jason Trommetter on Flickr (noncommercial use permitted with attribution / share alike).